Crystals are not painted on the pots. Just as water under the right conditions turns to snow, so a crystalline glaze under precisely the right conditions develops crystals. There is however no guarantee that any ctystals will be formed or how many crystals there will be on any given piece. The pots are first fired to 1000c, called a bisque firing, the glaze is then applied, the pot is fired again, this time to 1260c in an electric kiln. Once the kiln reached temperature the lid is lifted and the kiln is quickly cooled to 1000c. At this stage the glaze is in a molten state ( similar to partially set jello). The kiln temperature is held there for 4 to 6 hours. In this period two atoms come together and form a nucleus (seed), from which the crystals grow. The glaze is comprised of approximately 25% zinc oxide, and 25% silioa. They join together in the firing process to form the natural mineral Willemite, also called Zinc Orthosilicate. Colour in the glaze is created by oxides, such as cobalt, iron, copper, manganese, nickel and titanium. Combinations of these oxide create different colours. A pedestal the same diameter as the base of the pot is glued to the pot, this allows the glaze to run off the pot and catch in the basin. The glaze has no aluminum in it, making it very fluid at 1260c. 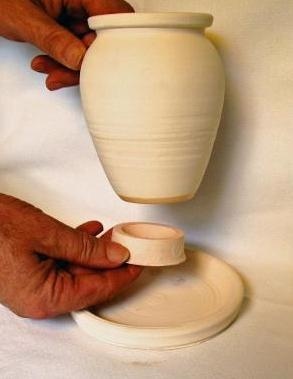 Once the pot is fired the pedestal is broken off leaving a rough surface, that must be ground off.